SPECIAL REPORT: Elisa Panjang, a distinctive name for a Sabahan native. Pangolins, about the size of a small cat and also known as scaly anteaters because of their appearance, long tongues and favourite snacks. Pangolins are mammals that inhabit tropical forests, dry woodlands and the savannah. What does Elisa and pangolins have in common, apart from the fact that the pangolin is said to be among the most trafficked wildlife in the world. Like most other pangolin species, the Sunda pangolin is hunted for its skin, scales, and meat. 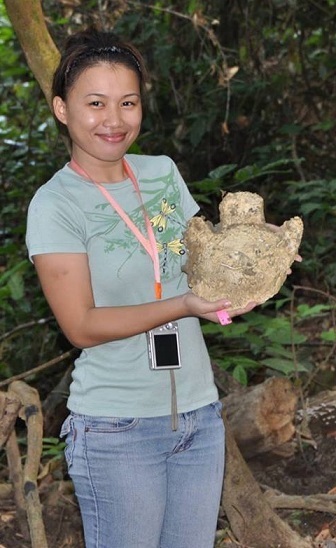 Now Elisa is not just your average Kadazandusun lass; in fact she is a PhD student from Cardiff University with particular interests in pangolin ecology and behavior studies. Born and raised in Sandakan, she also holds a B.Sc. (Hons.) in Conservation Biology and a M.Sc. 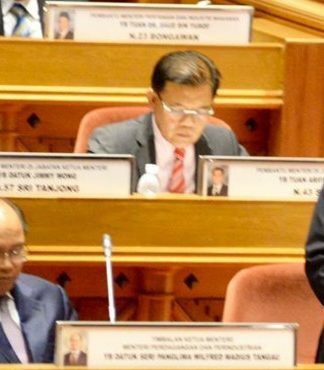 in Ecological Processes, both from University Malaysia Sabah, and added to that has a Diploma in Civil Engineering from Politeknik Kota Kinabalu to boot. But she decided to change her course because of her interests in nature and wildlife. 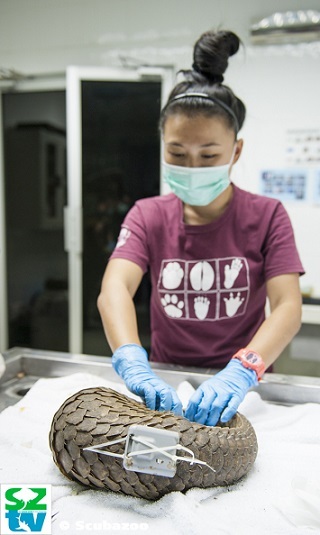 Elisa is a member of the IUCN-SSC Pangolin Specialist Group and currently is fully based at Danau Girang Field Centre. 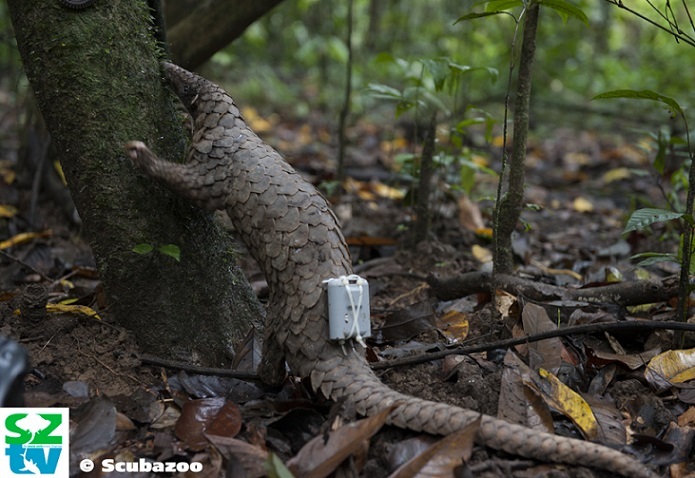 A tagged pangolin released into the wild, so that its habits can be monitored. Here she conducts her research, and sometimes perform her job as a Pangolin Conservation Officer, educating and raising awareness about pangolins in Sabah. After finishing her study, Elisa hopes to use her knowledge and experiences to collaboratively improve the implementation of biodiversity conservation in her country. Pangolins are completely covered with scales made of keratin – also found in human nails – which start off as soft and harden as the creatures get older. The armour-like scales come into play when pangolins are under attack, when they curl up into a spiky ball. Its scales are sometimes made into rings as charms against rheumatic fever or powdered for as traditional medicine. Its meat is eaten by those who believe it to be good for health or as a cure for arthritis, asthma and back pains. None of these supposed uses are backed by scientific evidence, Elisa painfully points out. “The demand is mostly driven by the Chinese, and indigenous people who hunt for wildlife. As conservationists we are battling to save the pangolin, the most illegally traded animal in the world, before it is ‘eaten to extinction’,” she states as a matter of fact. The Sunda pangolin, the only species found in Sabah, is protected under Schedule 2 of the Wildlife Conservation Enactment 1997, meaning any hunting or possession requires a licence. Unlicenced hunting is punishable with a maximum penalty of five years’ jail, a fine of up to RM50,000 or both. “I grew up in a village in Sandakan surrounded by forest and I first saw a pangolin when I was 10 years old. I was playing outside and saw one walking towards the trees from around my house. I think I fell in love with pangolins that day because of its weird look, with its scales, the way it moved and so on. 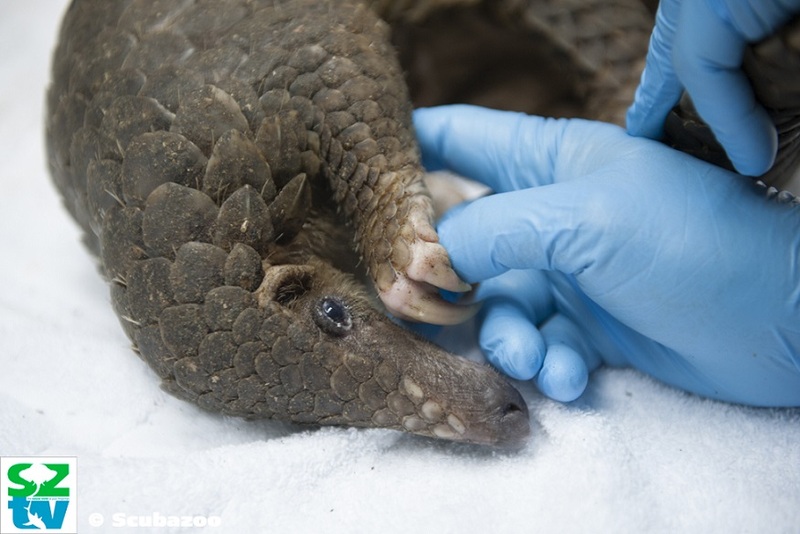 Elisa performs the delicate operation to tag a pangolin. “I ran to my mom to show her the animal. She told me the creature was called ‘tenggiling’ (pangolin in Malay) – which also sounded weird to me at that time. Before this, I had never even heard of ‘tenggiling’ let alone pangolins, but then they became one of my favourite animals. “I chose to study pangolins because they are so mysterious, understudied and sadly, endangered. I think there are many things about them that we don’t know and I am interested to uncover these mysteries as well as be the voice for the species. 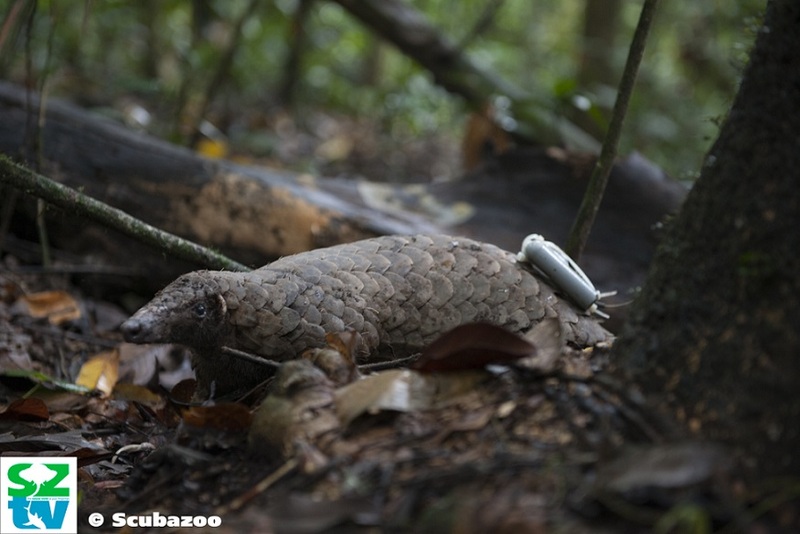 To appreciate what Elisa is doing is indeed good news – she turns out to be only Sabahan and Malaysian ever to do a PhD on the pangolin with Cardiff University, thanks to the opportunity provided by DGFC Kinabatangan – one must get at least a glimpse on the extent of the bad news. 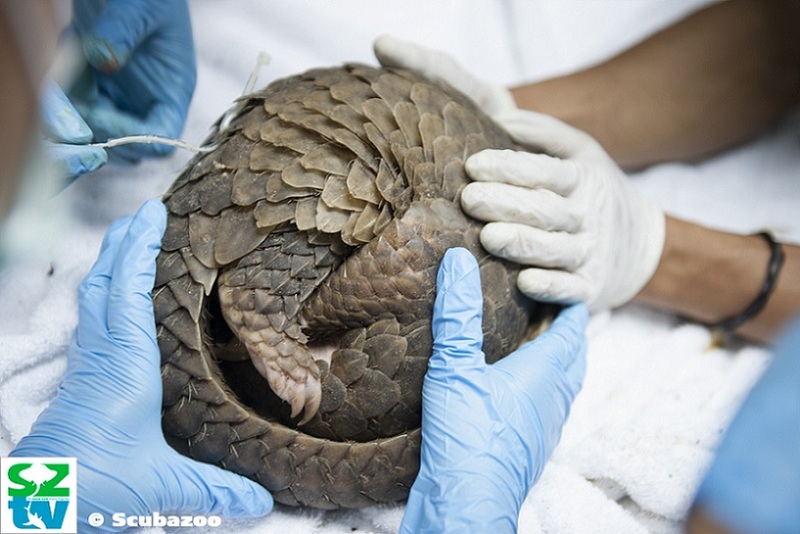 The bad news is at a staggering US$7,000 (approximately RM30,000) per head, wild pangolins – an obscure creature – is being rapidly hunted to depletion as it has become the most trafficked wild mammal in the world, for both its scales and meat! The spectre of doom is not far-fetched, given spectacular news like Vietnamese Customs seizing 6.2 tons of frozen pangolin meat from Indonesia not too long ago. Sabah contributed to 22,000 Sunda pangolins killed in 2009. 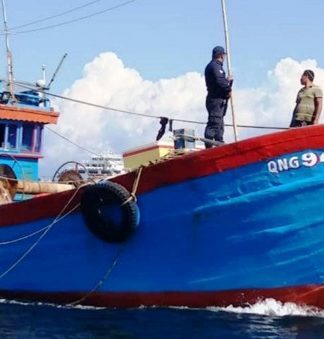 In December 2011, a newly-formed Special Marine squad seized 178 containers holding 1,068 frozen pangolins worth US$1.26 million – Sabah’s largest seizure of pangolin meat in history – after a wild goose boat chase in the East Coast, making it part of the 23,400 pangolins confiscated worldwide between 2011 and 2013 alone! Elisa said she‘s not surprised by it. 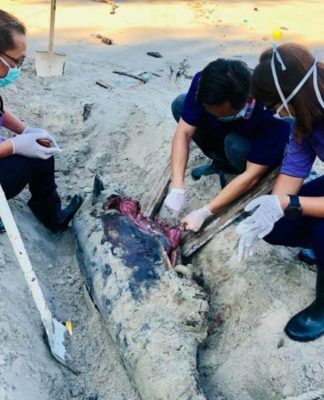 “Sabah is considered one of the hotspots for smuggling, like a point for our pangolins and also other pangolins from the Philippines forward to Vietnam and China and so for me, enforcement, education and research is what we need to do to get more information, and this is very important,” she said. The IUCN estimated over 1 million pangolins were killed for meat and scales over the last decade. 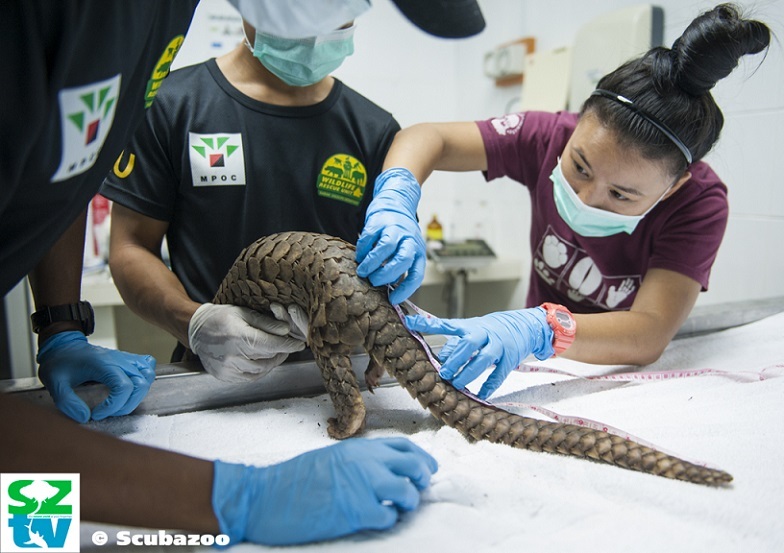 “I am a member of the IUCN Specialist Group on pangolins so I know this is true… it’s really bad and then in Sabah, despite it being protected, the authorities still find people capturing them at road blocks,” Elisa noted. But all these known reports are probably just the tip of the iceberg on this mushrooming illegal trade. “For me, we need to do something about the illegal trade. Without tough measures to cut down or shut down demand and effective measures to create pangolin strongholds in their home ranges in Africa and Asia, the survival of this uncharismatic armour-plated termite and ant-eating creature will be lost to a gruesome trade for its meat, foetus included, and scales. To add to the problem, even conservationists tend not to give focus to this solitary, nocturnal creature as they are pre-occupied with bigger, more famous species like the elephants which are being killed at 35,000 per year for ivory and the rhinos being slaughtered at 810 heads per year. 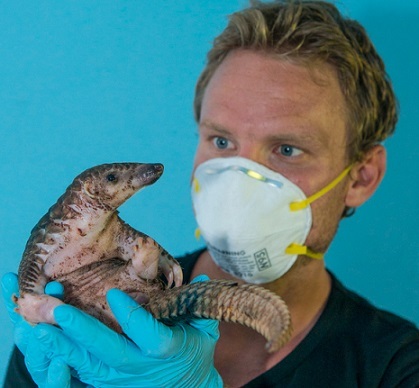 Under its new exciting series – Borneo Jungle Diaries – SZtv presents environmental photojournalist, Aaron ‘Bertie’ Gekoski, who follows Elisa to tag a Sunda pangolin for the first time ever in the jungles of Borneo. All episodes will have Bahasa Malaysia subtitles and be released on SZtv & DGFC Facebook page, as well as Scubazoo.tv and Youtube @ScubazooTV. The episodes will also be featured on the Malay Mail Online and BorneoToday. What’s more, viewers are encouraged to take part in the competition that is being held; All you have to do is answer five questions from the episode correctly each week to win a 4 day / 3 night stay the Danau Girang Field Centre.